By their very nature, transom-mount motors often find themselves on big water, with big waves and big wind. 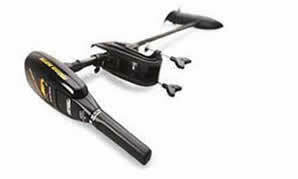 When the going gets tough, you not only want a trolling motor that is equal to the task, but keeps you in control. That’s Maxxum. Tilt Twist Tiller™ — Puts natural outboard convenience in the palm of your hand. Quick access. Instant response. Multi-position handle. Maximizer™ — Get up to five times longer run time on a single charge. Maximizer™ technology controls the draw of power at infinitely variable speeds to conserve battery power and extend run time. Battery Indicator — A push of the button lets you instantly see precisely how much power you have left. Cool, Quiet Power — Minn Kota’s larger brushes, windings and commutators generate less heat, less noise and run cooler…extending motor life and conserving battery power. You get greater sustained thrust and more time on the water. A unique bearing system produces low rpms/high torque to cut down on fish-spooking noise—so quiet they’ll never hear you coming. Weedless Wedge™ — The only prop that is truly 100% weedless. Patented, swept-back design pushes weeds away, allowing you to effortlessly pass through at any speed, conserving your valuable battery power. 3-Year Warranty — All Minn Kota Maxxum trolling motors feature a three-year warranty. Max 40T 36" 12v 40lbs 1368308 70330 SOLD OUT! Max 55T 36" 12v 55lbs 1368335 70335 SOLD OUT! Max 55T 42" 12v 55lbs 1368336 70336 SOLD OUT! Max 70T 42" 24v 70lbs 1368337 70340 SOLD OUT! Max 80T 42" 24v 80lbs 1368338 70344 SOLD OUT! Add to cart to order.